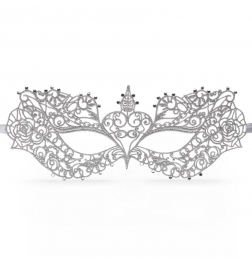 Paramour Mask by Baci Lingerie has a delicate metal structure and features black satin ribbon ties for secure wear. Inspire intrigue with our black enameled filigree eye mask adorned with crystal elements. Its delicate metal structure offers gentle flexibility for a perfect fit on the face, and features black satin ribbon ties for secure wear.